Creamy, smooth and absolutely delicious! A traditional Taramasalata recipe (or Taramosalata) made from fish roe, olive oil, lemon juice, grated onions and bread. Simply delicious! 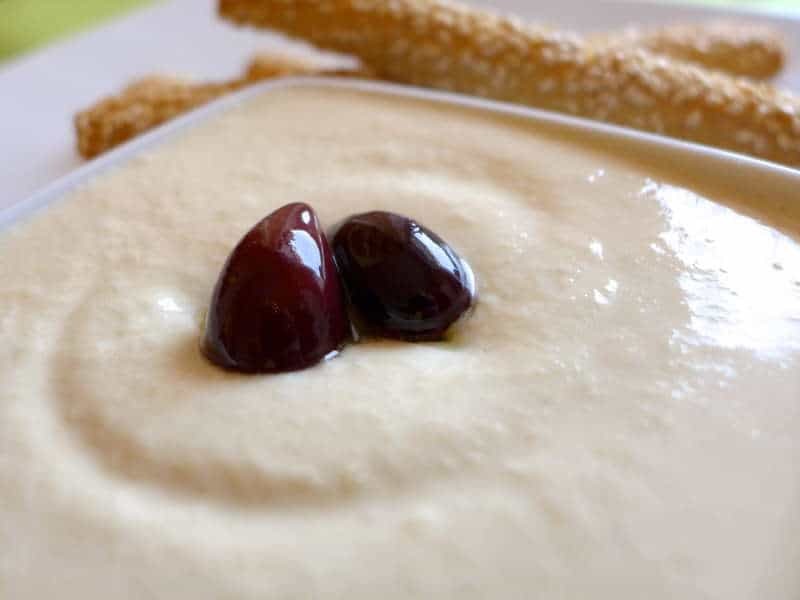 Usually served as part of a meze platter with lots of pita breads or bread, taramasalata is a very popular Greek dip throughout the year, but especially on Shrove Monday, the first day of the Easter lent. Taramasalata – Homemade vs. Store-bought? This intense flavored homemade taramasalata recipe can’t compare with the store-bought. Mass-produced taramasalata is more often than not of poor quality and has a very bright pink hue due to the addition of food coloring along with lots of unnecessary thickeners. Fresh taramasalata is really easy to make at home, as the tarama and bread mixture is emulsified with olive oil, giving it a natural thickness, smoothness and exquisite taste. Depending on the type of roe used in each taramasalata recipe, its colour can vary from light beige to pale pink. So if you find yourself dipping your fluffy pita bread into a bright pink taramasalata dip, be sure that it has been saturated with food coloring. So spare yourself from all the unnecessary conservatives, thickeners and food colouring! Give this traditional taramasalata recipe a try and enjoy your own fresh homemade taramasalata in less than 15 minutes. To prepare this delicious taramasalata recipe, start by soaking the bread (crust removed) in water and squeeze well to remove the excess water. In a food processor add the bread, grated onion and the tarama. Blend until the ingredients are mashed (like a pulp). Add half lemon juice and blend a little more. Pour in the olive oil gradually (just a little bit at a time) whilst blending, like making mayonnaise. Blend until the oil is incorporated and the mixture is smooth and creamy. Taste the taramasalata add some more lemon juice, according to preference and blend again. Serve this traditional Greek taramasalata dip with lots of pita breads aside. (If you feel adventurous enough make your own homemade pita breads with this easy recipe!). Eli, I would like to make this gluten free by using potatoes instead of bread. Could you give us a conversion using potatoes. Please include the type and amount of potatoes and any changes to processing steps. Thanks. I have never tried it with potatoes, but will give it a shot and come back to you. Hi! I’m Asian (born and raised), and I don’t have any basic intelligence on Greek cuisine to save my life. But I ate taramasalata once, and I fell in love with it immediately (I’m surprised I haven’t married it yet!). My question is, how long can I keep it in the fridge until it loses its freshness? And how do I know what fresh taramasalata tastes like? Thank you! Do you prepare the roe yourself? I’m wanting to make taramasalata with fresh roe I collect from fish I catch but haven’t been able to find the process for drying and preserving it. I remember years ago it used to be coated in wax but I haven’t been able to find it lately. Best if made the day before you plan to serve it. Freshly made, mine tasted of nothing but lemons, but a day later the flavours had blended and it was really good. Hard to believe a website called “mygreekdish” would actually allow the word “taramAsalata” on it. Shame. Hi there! The only reason this word is in there is because lots of people are searching for the recipe using that keyword. Over 2000 searches in the past couple of months! Hence I had to place that word somewhere in the article to allow them to find it when searching. That is how I found this site! I’m glad you did use the word, “taramasalata”. If not I would not have been able to make this for my son. A special occasion dish tonight. Thank you for posting the recipe. I miss good taramasalata. Where can I buy the roe please? I am in Florida. Hm Im not sure. When I was living in London, I was buying mine from the local fishmonger. Had to order it a few days in advance for him to bring it in. Would you be able to tell me where on the upper east side of Manhattan I might be able to find the fish roe to make the Tarama Dip. Many thanks! Do you use raw fish roe? How should the raw fish roe be prepared? I ordered Fantis Tarama on Amazon . I’m going to make some taramosalata this weekend. I kind of remembered how to make it having grown up in a Greek-American household and having watched my parents prepare it. But your recipe helped refresh my recollections.The method is similar to skordhalia which can be prepared with bread, potato or a combination of both. I don’t think I’ve ever had Taramosalata made with potato but it should work.